Price – Special Package only $1,799.00 – I want it all special! 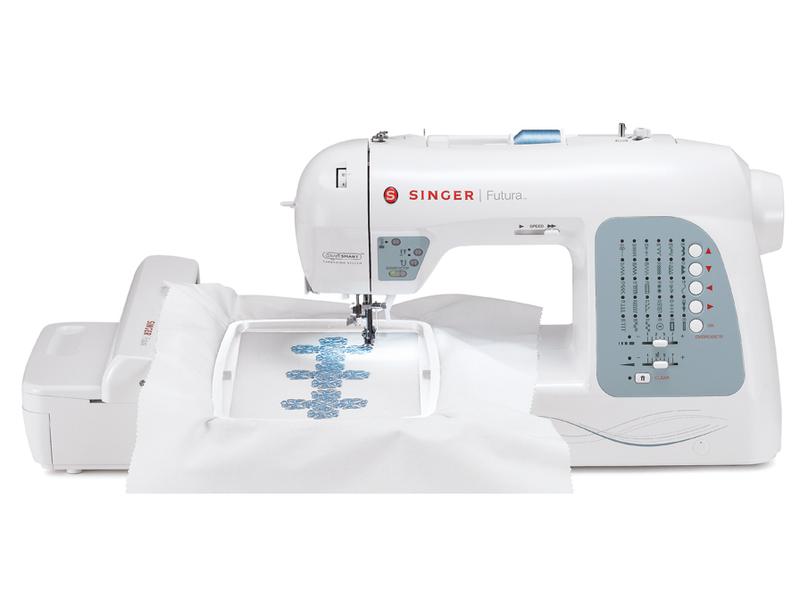 The Singer Futura xl 400 Computerized Sewing Embroidery Machine is part of special package from Sewing machines Plus is packed with goodies. All the Singer XL -400 software is included, 80 spools of thread, Wilcom resizing and conversion software, Stabilizer kit, Kay Brooks instructional video and a Florian thread converter. All sounds good? Let’s have a look at the Singer XL – 400 Functions and Features first, then we’ll move onto all the extras goodies and see if this bundle is worth purchasing. 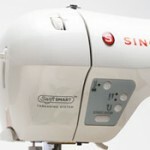 SwiftSmart™ – a threading system unique to Singer, this includes an automatic needle threader and is a great time saver. 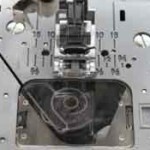 Separate Bobbin Winding Motor – no motor disconnect needed when winding the bobbin, you can wind and sew at the same time! Speed Control – there is an button at the front of the machine for speed control, a handy feature when working on intricate designs. StayBright™ LED Lights – there are 6 of these popular LED lights giving you a well-lit area and eliminating or reducing eye strain..
Drop & Sew™ Bobbin System – handy automatic thread pick up and a clear plastic cover which lets you see the amount of thread left on the bobbin.. 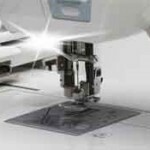 Extra High Presser Foot Lift – this feature makes it easy to slide bulky or multiple layers of fabric under the needle. 2 Built-In Spool Pins – there is a horizontal and vertical thread delivery, handy for different sewing techniques, like top stitching and for sewing with twin needles. 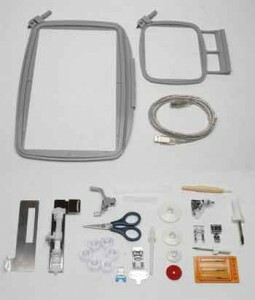 2 Accessory Trays – one is within the removable extension table and the other in the embroidery unit. 2 Snap-On Hoops Included – a large 10″ x 6″ and a small 4″ x 4″ come with the Futura XL-400. Multi-Hoop Capability – designs of up to 18 ½” x 11” can be embroidered with the optional extra hoops. 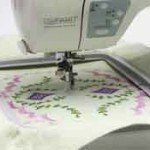 125 Embroidery Designs – get started straight away with the included embroidery designs. Design File Capability – most embroidery design formats can be read. Basic Editing – all designs can be edited, the possibilities are endless. From flipping, repeating, reducing and enlarging to using thread color charts. Multiple designs can be combined into one and there are plenty of fonts to personalize your project. Extra Large Sewing Space – the space to the right of the needle 8 1/4 inches, great for bulky projects. Trace Design – this feature allows you to trace the design within the embroidery hoop for accurate placing. 3D Realistic View – the view on the computer screen is seen exactly as it will sew. You can print the design to create templates. USB Connection – connects to the computer with a USB cable without the need for extra hardware. Windows® Compatible – for use with Vista up to Windows 8.1, software updates are easily accessible at the Singer Futura support section. Built-In Tutorials – the instructions are built in with easy how-to instructions. Automatic One-Step Buttonholes – there are 2 fully automatic buttonholes using a 1-step process. Using the exclusive buttonhole underplate, buttonholes can be created on thick and uneven fabrics as well as in awkward places. 4 in 1 – suitable for quilting, dressmaking, embroidery and serging. Sturdy Quality Construction – heavy duty metal frame for longevity and durability. Operating System – Windows XP, right through to Windows 8, 32 and 64 bit. 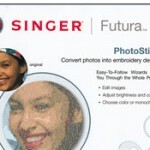 Singer Futura XL-400 Software Requirements. 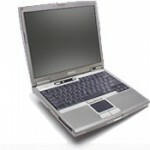 PC with 1 GHZ Intel or AMD Processor. Windows Operating System. XP / Vista / 7 / 8. 1 Gigabyte of RAM (more recommended). 500 Megabytes (or more recommended) of free hard disk space to install. Color standard (1024 x 768 pixel, 65,000 colors recommended) VGA adapter with a color VGA monitor. Feet include – general purpose, blind hem, buttonhole with underplate, button sewing, embroidery, satin stitch, and zipper. 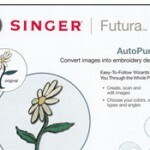 To see how easy it is to do embroidery designs watch this video from Singer. 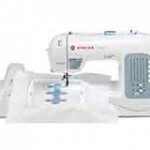 You can see also view other videos showing the capabilities of the Singer over at Sewing Machines Plus. Now we move on to the rest of this bonus package, let’s see what’s included. AutoPunch Software (Value $499) – this software allows you to choose colors, angles and stitch types. You can create designs from photos, scanned images, clipart and more. PhotoStitch Software (Value $299) – Easily convert photographs into designs with color or monochrome option available. 3900 Embroidery Designs – this bonus pack of designs lets you get started straight away! The remarkable ‘Incredible Threadable Box’ holds colors separately and allows the spools to be easily removed and replaced, as each color number is printed in each thread pocket. The built-in threading system (Patent Pending) allows you to run the thread directly from the box to the machine without unpacking. This tangle-free system even has a thread cutter built into the handle. The Madeira Incredible Threadable Embroidery Box – contains $570 worth of accessories. 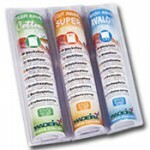 80 Smart Spools of Madeira embroidery thread. CD with 42 embroidery designs. Klasse 5 pack Embroidery Needles. 1. Pull all colors needed for embroidery design. Place spools in thread chambers in color order, working left to right on each side. 2. Pull each thread up from its chamber and through its corresponding thread guide. For best results thread must feed from the outside of spool. 3. Close the doors and stand up the box on its base to the right of the machine. 4. Grasping all threads at once, clip ends to even using the built-in thread cutters. 5. Thread machine with first color and begin stitching, repeat for each color. Thread should feed from right side of box, up and through guides, and directly into your machine. 6. Rotate box to access second set of chambers on reverse side. Guides can be threaded from both sides if you are using both sides of box. Kay Brooks DVD, Floriani Stabilizing Solutions. Learn how to make your embroidery look perfect. Covers a variety of stabilizers. TrueSizer is a file conversion tool offering design scalability and compatibility betweens domestic and industrial embroidery formats..
Thread Converter Pro III – color conversion software which lets you match your thread to a design and converts between 14 thread manufacturers. It also prints an instruction sheet after you’ve made your selections. Free Laptop – a refurbished Dell laptop running Windows 7. You can keep this laptop exclusively for you embroidery designs! If you’re only a beginner this whole package is a lot to take in and a steep learning curve, especially with the computer software. You don’t need to be a computer geek but should be comfortable trying new software. Disappointing it’s only available for Windows operating systems, sorry Mac users, you seem to have been forgotten. 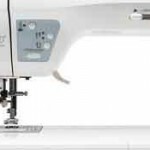 The extra space which makes it a multi-function sewing machine. Versatility for designing, great for making customized presents. The extra large hoop capability. Plenty of videos specific to this machine. Is it worth getting the package? If you do a lot of quilting and embroidery then yes. You’re getting $4,499,00 at worth of goods for less than half price at $1,799.00. You also need to ask, do you need another laptop although, having a dedicated design machine leaves your main computer free. Want the whole package? Buy the Singer Futura xl 400 Computerized Sewing Embroidery Machine here for less than half price! Nice site about quilting tools, your information is easy to read. My mom is a quilter and would love your site. Wow! This is a steep learning curve 🙂 I love it! What a wonderful set you get for such a good price. Well worth the outlay, and you would soon get your investment back with all the money you could save by using it. WOW! I don’t know ANYTHING about sewing machines but this looks and sounds AMAZING!… I found your site because my Mrs is into the old family tradition of making quilts and handing them down through the women in the family line and she works on a cronky old Singer, so I thought I’d look around and see what’s out there… I didn’t know sewing machines had gone so high tech! Amazing machine! I’m truly impressed by the automatic needle threader (always a pain for me!) and the free laptop! Wow! It’s amazing what sewing machines can do now. I would say that 125 embroidery designs is a more than decent amount. I am impressed with all the features and functions the Singer Futura xl 440 offers. I have never used such a sophisticated sewing machine before but I am sure that all the computerized functions can make things really easy. Thanks for sharing. Currently I own the PE500, but this will be my next machine for sure. So many features and options, it is truely a great piece of machinery.